Take the Brain on Finance Quiz! MILWAUKEE, November 7, 2017 – Thinking about important financial decisions doesn’t just stress people out – it actually impacts their brain function, according to new research released today by Northwestern Mutual. And that mental stress can often lead to poor decision making. Neural signals associated with relaxation and recognition increased by 20.8% and 28.6%, respectively, for “assisted” scenarios compared to “unassisted” scenarios. Neural signals associated with attentional demand tended to be 20.0% higher (i.e., more difficult or stressful information processing) during “unassisted” scenarios versus “assisted” scenarios. Northwestern Mutual partnered with ThinkAlike Laboratories, a neuroscience research firm led by Sam Barnett, Ph.D., who is also a researcher at Northwestern University, to measure the electrical activity of people’s brains when they are evaluating various financial scenarios. This new brain research was prompted by recent findings from Northwestern Mutual’s annual research—The Planning and Progress Study—that revealed Americans’ high levels of financial anxiety. The 2017 study found that, regardless of age, at least eight in 10 U.S. adults feel some anxiety due to the rising cost of healthcare, unplanned financial and health emergencies, income and savings. In contrasting times when people received assistance with when they made decisions on their own, researchers found the latter situations led to brain signals associated with 20% more effort to pay attention during decision-making. In other words, people needed to concentrate significantly harder when facing financial scenarios without assistance. With assistance, their brains appeared to have an easier time, which helped individuals make better decisions. During assisted financial scenarios, people experienced a 28% stronger ability to recognize and understand the crucial concepts they were considering, making for clearer and more effective decision-making than without any assistance. Not only did assisted scenarios provide better mental clarity and understanding, but assistance helped people be nearly 21% more relaxed and able to focus calmly compared to when they did not receive assistance. Put simply, when individuals were guided through the decision-making process, they were 21% less stressed than when they were unassisted. Dr. Barnett and his team developed a fun online quiz for people to discover how their brains function when it comes to financial decision making. To learn about this neuroscience study and watch a video, visit brainonfinance.com. ThinkAlike Laboratories LLC applies cutting-edge neuroscience research to gain unique insights into complex human behavior. Led by PhD neuroscientists, the team’s innovative research has been published in numerous academic journals and national media outlets. ThinkAlike’s patented technologies can test brain activity in various contexts by using tools such as electroencephalography (EEG), which allows scientists to measure neural signals directly and minimize subjective biases associated with traditional survey research. 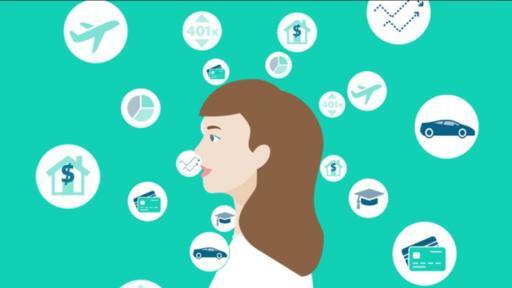 The 2017 Brain on Finance Study is an independent study of the neural impact of financial decisions, particularly to compare the experience with and without assistance. EEG was used on a diverse set of subjects to measure their brain activity during common hypothetical financial scenarios. Varying the level of assistance during hypothetical financial decisions led to statistically significant differences in neural patterns associated with attention, stress/comfort, confusion/recognition, and other cognitive processes. Northwestern Mutual has been helping families and businesses achieve financial security for 160 years. Through a distinctive, whole-picture planning approach including both insurance and investments, we empower people to be financially confident so they can live life differently. We combine the expertise of our financial professionals with a personalized digital experience to help our clients navigate their financial lives every day. With $250.4 billion in assets, $28.2billion in revenues, and more than $1.6 trillion worth of life insurance protection in force, Northwestern Mutual delivers financial security to more than 4.4 million people who rely on us for life, disability income and long-term care insurance, annuities, brokerage and advisory services, trust services, and discretionary portfolio management solutions. The company holds more than $100 billion of client assets as a part of its wealth management company and investment services. Northwestern Mutual ranks 97 on the 2017 FORTUNE 500 and is recognized by FORTUNE® as one of the "World's Most Admired" life insurance companies in 2017.